as the pleasure of Ohioans to recognize it. to his temporary discomfiture, perhaps, but to his lasting glory. Mary Ann in 1818 and William in 1820. 42 Ohio Arch. and Hist. Society Publications. the Year of our Lord, 1821.
get Cross, but twenty-nine days after the wedding, the third Mrs.
his employer's roof, and later with Isaac Maxon, another printer. the athletic games upon the common. No one could "raise"
at the very touch, and "Jack" Brough's was one of them. 44 Ohio Arch. and Hist. Society Publications. agement, took rank with the leading exponents of Democracy. 46 Ohio Arch. and Hist. Society Publications. by the results of their own acts, they had no right to demand anything. sooner or later it must be extended to them." fellow partisans and the ridicule of his political antagonists. to admit that he was terribly in earnest. the interests of the public were in all legal respects protected. 48 Ohio Arch. and Hist. Society Publications. 50 Ohio Arch. and Hist. Society Publications. important debates and was rarely absent at the taking of a vote. of the majority party, became the target of the opposition. but very active, and were loved by neither of the great parties. over whose bleeding rights they shed so many hypocritical tears." 52 Ohio Arch. and Hist. Society Publications. our southern brethren, let us not as a state join in this unholy warfare." reform in which the present general assembly has been engaged." and spoke well. He was industrious, business like and clever. in candor admitted that he would make an efficient officer. and confidence were susceptible of a stab, there did Mr. Brough stab. 54 Ohio Arch. and Hist. Society Publications. 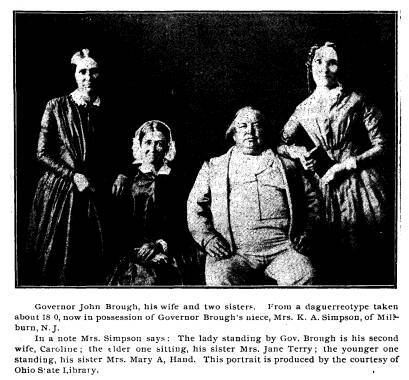 abiding place in Ohio, Mr. Brough will be its master spirit." yet reached the constitutional age of 30. He was then but 28.
occasionally to answer their charges, generally with success. trol it for personal or political motives." of history than as an argument. right he exercised as vigorously as he had ever done before. that policy, he punished them with his invective. portant in the state, and he is determined to make it still more efficient. his ambition to have the whole power of the board imposed on his hands. be employed, have begun to call attention thereto." should be robbed of four-fifths of his immense power. the school fund defalcations made good amounted to $12,000. and guard its interests in the courts. property at its actual cash value. ditionally and withhold the penalty from another who owns land. must have writhed under his lash! enactment of more efficient laws for the sale of delinquent lands. It was a splendid service that Brough performed as auditor. to what would be the condition of the state after the banks should close. than anything else to save the good name of the state. "Prior to 1842 there was no proper system of taxation in Ohio. tablishment of that principle in our financial policy." They threw Jack Brough into the hold for the ballast." of so able an officer." and retired to private life after ten years of strenuous politics. when he and political office should part. with his customary zeal, he again loomed up in the public eye. of a strong man at the helm of state instinctively turned to him. at first hesitated were now sure that the Union could not be saved. Failure in the field had bred something very like treason at home. largest audience that had ever gathered in Washington county. candidate, by a majority of 101,099.
pride of every succeeding year. 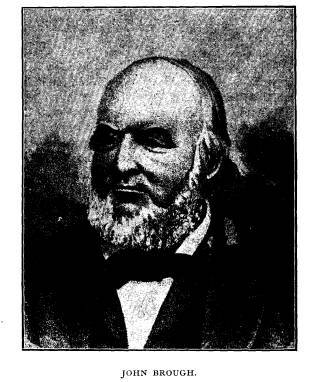 In his "Ohio in the War," Mr.
were upon Ohio, as her sons at home and in the field cast their ballots. It was felt that on the result at the polls hung the fate of the Union. takes root in spite of Truth's most earnest efforts!" business it was to distribute the relief performed their full duty. an appeal to private charity with excellent results. to make the Ohio soldiers in the field the state's special care. of the wounded may attribute early recovery, probably life itself. prompt and generous in praise of those who did it than Brough. judging by the enthusiasm of its beginning, would have predicted. temperate habits or immoral conduct." cers was a certain unpopularity because of his brusqueness. him for integrity and his sterling patriotism could not condone. few years that may yet remain to me." and trusting in Christ for pardon. standing on the right hand of the Father, making intercession for his sins. without intermission until his death." tinguished gentlemen I have ever known in Ohio." two children, John and Mary, both of whom are still living. now living, Mrs. E. B. Gerard, of Cincinnati. The second Mrs.
the highest qualities of statesmanship.